This guide is available to download as a free PDF. Download Skype Shortcuts for Mac OSX now. Feel free to copy and share this with your friends and family. Skype is one of the most popular ways to communicate with friends and loved ones. One of the features people often miss out on is the handy keyboard shortcuts, simply because they cannot remember them all. 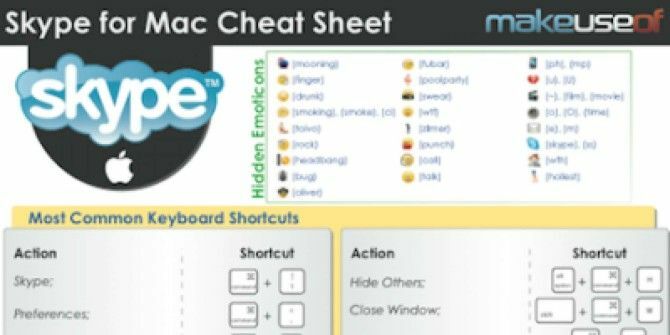 Well, with our handy cheat sheet, you will be able to see all the useful shortcuts at a glance! We also have all of Skype’s unique smileys listed here for easy access. If you find this cheat sheet to be useful, please share it with your friends! Explore more about: Cheat Sheet, Skype. How Much Bandwidth Is Used by a Skype Call?